Whoah. Way harsh. Given that a goat is sacrificed almost daily to “protect Zardari from black magic,” maybe the President should consider being a little nicer to people, especially those who show up at his rallies. Think about the poor goaties, Zardari sahib. As many of you know, I am Pakistani. My allegiance to this country has been the driving factor when I decided on my educational focus, my career path, and of course, this blog. What many of you don’t know, however, is that my mother is Bangladeshi, and I am very proud of my Bengali heritage and family. Throughout my life, I never had to look far to learn about 1971 – the entire Bangladeshi side of my family was somehow involved in the war. 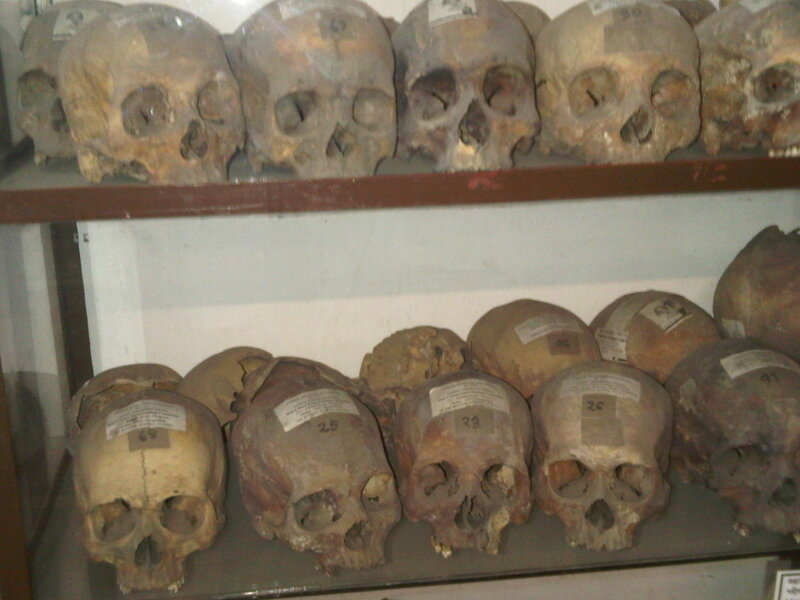 What I heard first hand was haunting – stories of mass graves, protests, torture and defiance. But growing up in Pakistan, these anecdotes clashed considerably with how the war was presented and perceived in Pakistan. While I am very aware that there is no black and white to any conflict, such a discrepancy was a challenge to better understand and share my own observations of the war. I write this piece fresh from a trip to Dhaka and a day after convincing my lovely cousin to accompany me to the Liberation War Museum, which displays the history prior to and during the 1971 War. The museum sits in a house in Shegunbagicha in Dhaka, leased out by the family of one of my cousins and managed by curator Akku Chowdhury. The museum is rich with information, filled with remnants of a history that heavily defines the Bangladeshi collective. 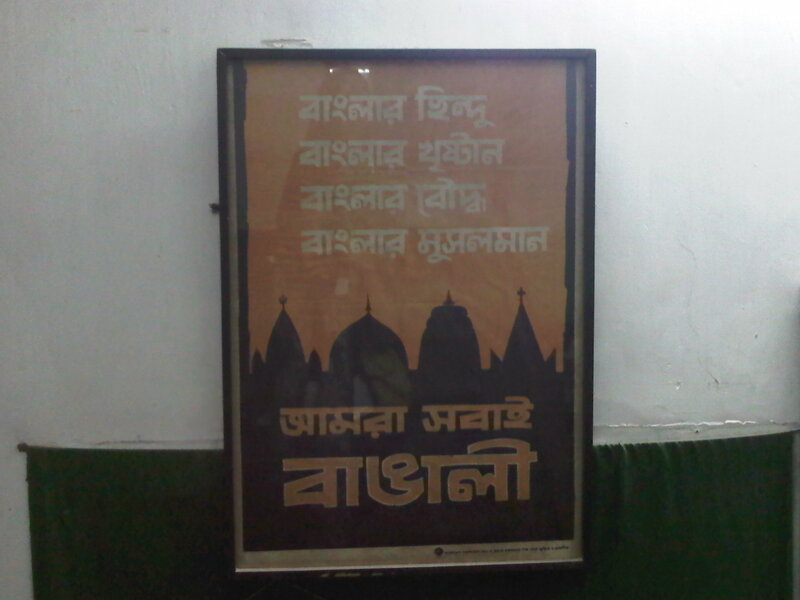 One of the first rooms you enter is a display on the 1952 Language Movement, which called for the recognition of Bangla as a second official language of Pakistan (Urdu was established as the sole national language after 1947). This protest over language, bringing men and women alike on to the streets, sparked a nationalist fervor and marked the beginning of the Bengali demand for their democratic and cultural rights. In 2000, UNESCO established February 21 as International Mother Language Day, in tribute to the movement and the subsequent lives lost. As I walked through the museum, jotting down thoughts and taking illicit photographs (please note: you are not actually allowed to take photos in the museum, my apologies to the museum staff who tried valiantly to stop me), several pieces caught my attention. 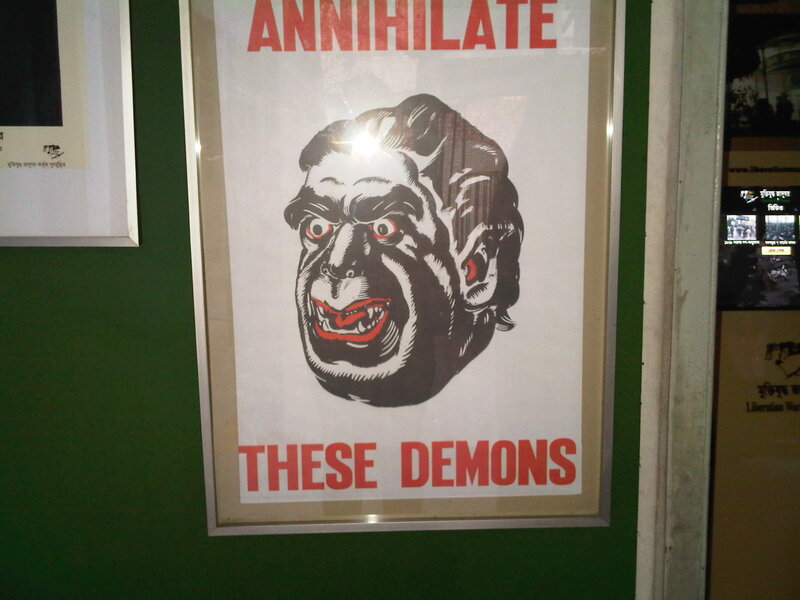 The first was a poster of the iconic cartoon by ‘Patua’ Quamrul Hassan depicting former Pakistani president Gen. Yahya Khan as a demon, accompanied by the text, Annihilate these Demons. From my understanding, the “demons” referred to the Pakistani soldiers undertaking the military operation that began in March 1971. Photos taken by crappy camera phone, apologies. By using what Nixon and Kissinger called quiet diplomacy, the administration gave the green light to the Pakistanis. In one instance, Nixon declared to a Pakistani delegation that “Yahya is a good friend.” Rather than express concern over the ongoing brutal military repression, Nixon explained that he “understands the anguish of the decisions which (Yahya) had to make”…. 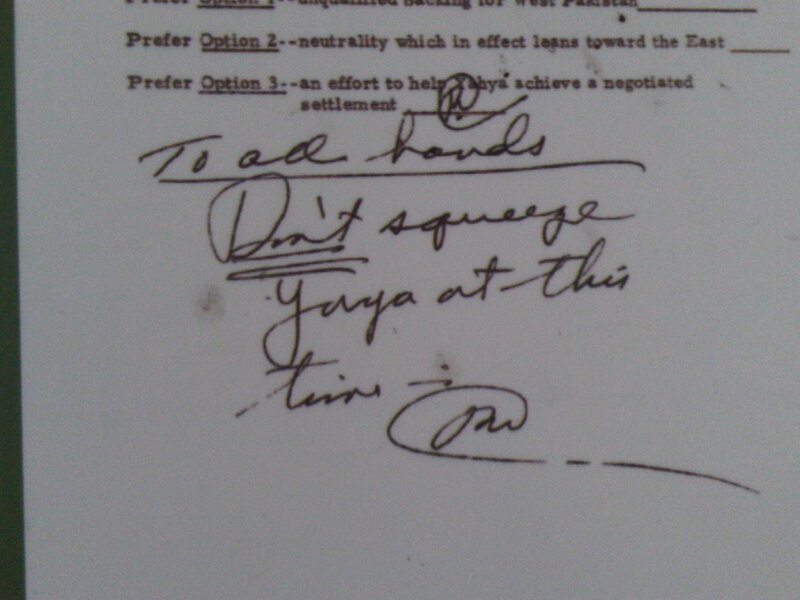 In a handwritten letter on August 7th, 1971, to President Yahya, Nixon writes: “Those who want a more peaceful world in the generations to come will forever be in your debt. The museum display was a telling example of how strategic interests and realpolitik often outweigh what is morally right or acceptable. Walking through the Liberation War Museum, I was constantly reminded of this fact. 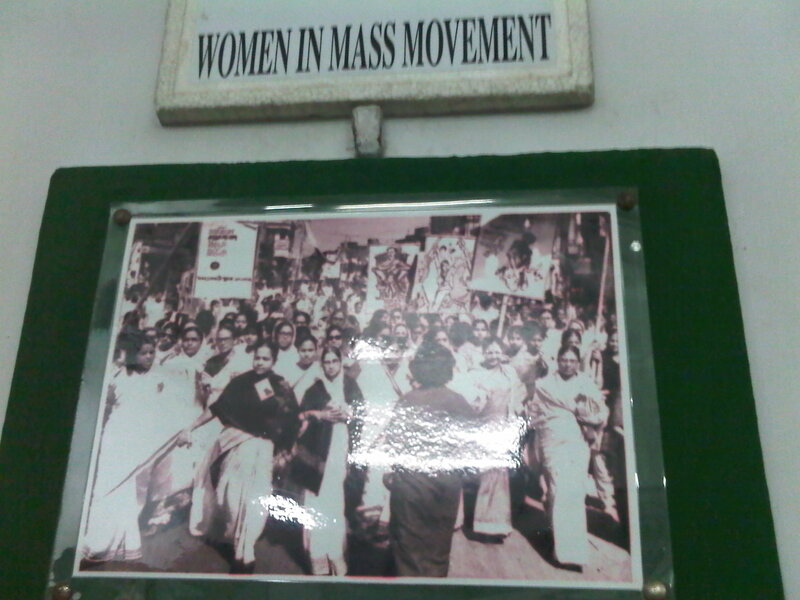 Many of the rooms contained uniforms, photos, and belongings of the innocent civilians killed, as well as those of the Mukthi Juddha (“Liberation Fighters” who were part of the militia, the Mukhti Bahini). One particularly memorable and disturbing display featured the 70 skulls and 5392 other bones recovered from a “killing field” in Mirpur, Dhaka, where many who were killed by the Pakistan Army were discarded. 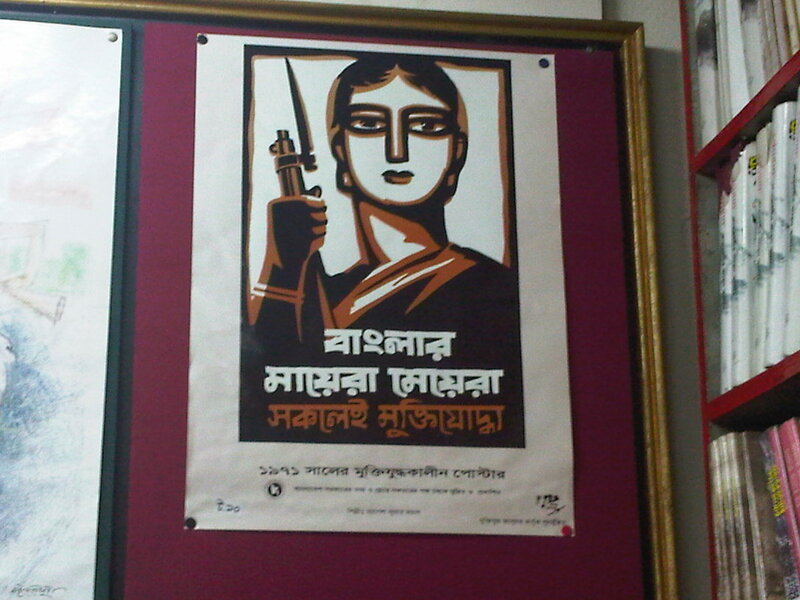 Translation: "All Bengali Mothers and Daughters Are Liberation Fighters"
It has been 39 years since the 1971 War, and there are still many lessons for Pakistan to not only learn but also accept. As Imran Khan over at the blog ATP recently noted, “History must never be forgotten, no matter whether it is flattering to you or not. It is well know than each nation tells its people the lies it chooses. We in Pakistan have done this too, including on the events on 1971.” A nation, in my opinion, is strengthened by its ability to accept responsibility for its mistakes. This is applicable to today as it was back then. Cutting edge technology? Na, try Google. 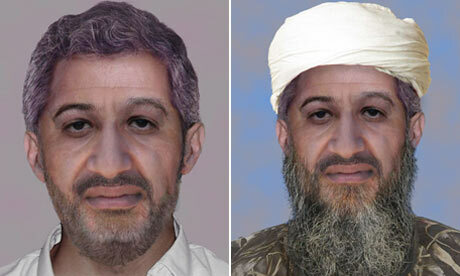 At first glance, it looked like OBL was either badly in need of sunlight or prescribed to the same skin regimen as the late Michael Jackson [RIP, MJ]. Turns out that “digital enhancement” was just the product of really, really ridiculously good Googling. Turns out not all intelligence is intelligent. Go figure. On Thursday, Dawn reported that rescue workers recovered 16 bodies from under rubble in Kamsaar Village, just north of Muzzafarabad in Pakistan-Administered Kashmir. The people, traveling in a passenger coach, were reportedly trapped in the earthquake that struck Kashmir in 2005, a natural disaster that killed about 74,500 people and injured over 100,000 in the region. It has been over four years since one of Pakistan’s most devastating earthquakes and we are still recovering victims. We still bear the scars of the thousands of lives lost. And yet, despite the fact that man-made conflict prevails throughout the world, that discrimination and violence have torn countries apart, nature has the power to bring us all to our knees. In the aftermath of earthquakes, tsunamis, floods, and cyclones, we come together. For days, we have watched news and updates on the 7.0-magnitude earthquake that struck Haiti on January 12. On Thursday, a Haitian Red Cross official said as many as 50,000 may have been killed, while another government official estimated the death toll may reach 100,000. An International Red Cross official stated that up to 3 million people may have been affected by the quake. Watching the news, I was reminded of similar scenes that played out in the aftermath of the 2005 earthquake in Pakistan , when residents in Islamabad pitched in to help lift bricks and rubble in F-10, helping recover survivors from a collapsed apartment building. Hundreds of people collected blankets, food, tents, and clothes for the people displaced in Kashmir. Similar scenarios also took place following the tsunami in 2004, a disaster that killed nearly 230,000 people in 14 countries. 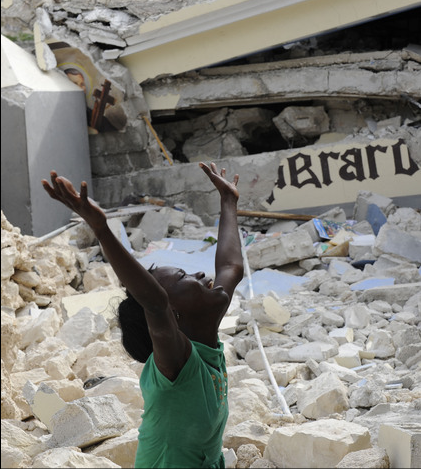 In the aftermath of Haiti, the global response and attention has been overwhelming. President Obama has promised $100 million in aid, and said the U.S. would grant “every element of our national capacity, our diplomacy and development assistance, the power of our military and most importantly, the compassion of our country” to Haiti. In less than two days, a campaign “done solely through text messages and made viral on networking sites like Twitter and Facebook has raised more than $5 million for the Red Cross’s relief work in Haiti,” reported CNN today. Red Cross spokesman spokesman Jonathan Aiken described it as “a phenomenal number that’s never been achieved before.” Lance Armstrong posted on Twitter that his LiveStrong Foundation would give $230,000 to humanitarian aid groups. On Friday, January 22, George Clooney will host a live telethon to benefit the victims of Haiti, airing from 8-10 pm EST on all MTV channels worldwide along with ABC, NBC, HBO and CNN. We shouldn’t have to ask why we should help Haiti. But if Pakistanis need a reason, we don’t have to look very far. Pakistan’s renowned philanthropist, Abdul Sattar Edhi has pledged $500,000 via the Edhi Foundation to relief efforts, and will reportedly travel to the country, (via Twitter user @curry_crayola). Given our own experiences with natural disasters, the Haiti earthquake should serve as a reminder about how connected we are, and how much we can do even in our small capacity. For a list of reputable and vetted organizations you can donate to, click here. The recent spate of targeted killings in Karachi has garnered much media coverage, with news agencies reporting that 41 people have died in the commercial capital since the beginning of the year, “including 10 MQM workers, 10 from a breakaway faction called Haqiqi, and 16 members of a committee set up by the ruling party in Lyari to control violence in the area.” Most of the victims were reportedly killed because of their political affiliations. Karachi has a long history of ethnic conflict, sectarian violence, land mafias and intra- and inter-party tensions. All these have been in play during this past fortnight, making it abundantly clear that a discerning approach to Karachi’s violence is required. Policing and investigations into recent incidents must be informed by knowledge of ‘local’ social, political and economic factors, which in this city of 18 million differ from locality to locality. For that reason, the MQM’s request for the Rangers, the army and intelligence agencies to maintain law and order in the city is akin to slapping a band-aid on a deep, infected wound. Q: Who are the main parties in this conflict and how did it escalate out of control? While Karachi has many rival gangs and factions, the main parties in the current conflict are workers or gang members associated with the Muttahida Qaumi Movement (MQM), which controls Karachi, and the Pakistan People’s Party, (PPP) which controls the provincial government of Sindh, of which Karachi is the capital. While some of the recent killings have been linked to the general crime syndicates, many have been attributed to the land mafia, noted a journalist currently covering the story in Karachi. For political expediency things are being blamed on just the land mafia or just the Baloch gangs in Lyari whereas it’s really a broader mix of elements. Some of it may be about land but in the end it’s all political and some say it has been linked with the abolishment of the local government system. Ultimately, Karachi has a long history of factional violence and gang warfare, so many of these factors have become yet another reason to reopen old wounds. Q: Why has Lyari been the hot spot for the recent violence and attention? Q: How effective have these paramilitary troops been in restoring some semblance of control in Karachi? As the targeted killings increased over the weekend, Interior Minister Rehman Malik ordered patrols by police and paramilitary rangers to curb the violence, while asserting that political parties were not involved in the killings. While this appeared to work, at least temporarily, the LA Times noted that many in Karachi “didn’t expect it to last.” The aforementioned journalist source, based in Karachi, echoed, “The rangers that have been sent in with the police won’t make much of a difference, particularly since the police is politicized and doesn’t come under the jurisdiction of the city government. Q: If violence between rival gangs and factions associated with political parties is not a new phenomenon, how can the cycle be broken? Although joint statements by the MQM and the PPP in the aftermath of these killings is significant, a top-down political solution will not be sufficient in fully addressing the multiple problems that exist on the ground. If the government seeks to achieve a long-term solution, [not just a strategy that places a band-aid over the problem] it must address the systematic root causes behind the violence and the inter-rivalries. Whether it’s the drug, land, or tanker mafia, this has ultimately been a struggle for power with continuously dire consequences. The girls said they changed their minds after coming to know that it was a wrong path to go and Fazlullah and his men were involved in torching schools and destroying bridges. She revealed dozens of girls like them fall prey to Taliban’s hands and the militants use them for suicide bombings. She appealed to all would-be suicide bombers not to carry out their attacks on the behalf of Fazlullah and his allies because such attacks result in killing of innocent people and their Muslim brethrens. It seems the military is arguably as intent in fighting this battle from an information operations standpoint as they are from a tactical perspective on the battlefield. Given the dissemination of Taliban propaganda, (often using the Al Qaeda production house Al-Sahab as their platform), Pakistan’s security forces are matching such efforts in this “battle for hearts and minds” with a campaign that villifies the enemy and sways potential Taliban sympathizers. The objective is simple: to marginalize support for these militant groups and cut their influence in this region. A number of people who spoke to this writer were critical of the decision to bring Fazlullah’s mother before the cameras in Swat’s Khwazakhela area. And mind you none of them had any sympathy with the Taliban militants. In their view, keeping women and children out of the affairs of militants fighting the state should be the guiding principle of the government and the military trying to win the hearts and minds of the people in militancy-hit Frontier. Recruiting young children and especially young girls into militancy is a disgusting tactic. That is undisputed. However, in this battle for the now-cliched “hearts and minds,” is it inappropriate or even counter-productive for Pakistan’s security forces to use them to convey that fact? Having Fazllulah’s purdah-wearing mother make an unprecedented public statement may help in villifying the enemy, but does it also earn the military supporters? Is there a line that the state shouldn’t cross? And here I thought eight years after 9/11, we had learned so much. I could get angry with Umar Farooq Abdulmutallab, the Nigerian who attempted to detonate an explosive in his underpants, forever earning himself the nickname “pantybomber.” Thanks to his actions on Northwest Airlines Flight 253 on Christmas Day, not just Nigerians, but people from 13 other countries dubbed “state sponsors of terrorism” have to suffer the consequences. The new rule will also apply to anyone traveling to U.S. destinations from those countries, who will all face extra scrutiny at airport screenings. But riddle me this, Mr. President – if the intelligence agencies screwed up, and the system failed to work, why are scores of people paying the price? Is this a sign of that mutual respect you so powerfully called for during your speech to the Muslim World in Cairo? Because, let me tell you, I don’t feel mutually respected when Don Juan of airport security calls me out of line, and not because he wants to perform a rubber sock puppet show for my enjoyment. I am all for keeping us safe, and I am all for fending off terrorist threats. I am from a country whose citizens have been victimized by terrorism, that has been waging its own war, however successfully, against a similar threat. Last year alone, over 3000 people died in terrorist attacks in Pakistan. So believe me, I understand that you don’t want that threat on your soil. But neither do we. Treating each individual as one massive threat will only add to the problem, because it fails to recognize the nuances of this conflict, or the tremendous importance of perceptions. It is sad that in the eight years after 9/11, that lesson still has to be learned.